Josh Heynes is preparing to swim across Lake Erie. For the second time. 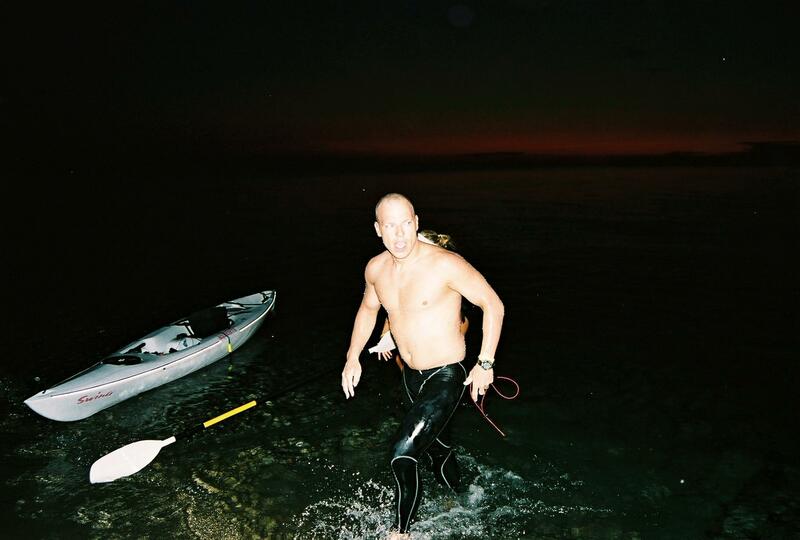 What's it like to swim 21 miles across Lake Erie, and in record time? "I don't really remember the swim itself," says Erie's Josh "Hurricane" Heynes, who swam the lake in 11 hours and 53 minutes in 2006. "I remember my stops, remember the finish, remember the beginning. But the middle part, it's all a blur." "You know, it's not just a physical thing," he adds. "It's more mental than anything else. This is like 10 percent physical, 90 percent mental. Because you could totally lose it out there." Despite not remembering the swim – or maybe because of it – Heynes is going to repeat the feat this summer. That's why we're at the LECOM Fitness & Wellness Center, Heynes sipping a protein shake, baseball cap pulled down to his eyes. He's born-and-bred Erie, a McDowell graduate, All-American swimmer at Pitt, and the former swim coach at Behrend. He currently works as a clinical exercise physiologist and trains elite high school swimmers. Heynes talks in bursts, and with the directness and brogue of the trainers in the old fight movies, which makes sense given the training regimen he set for himself. This morning's two-hour training session in the pool is part of his 10-month, four-hour-a-day routine to ready himself for this summer's lake crossing. It's not just swimming, of course. There's daily doses of TRX suspension training. ("It's a strap system – all body weight. I'm gaining strength, I'm not gaining a ton of size.") And cardio training of running or biking or working the elliptical trainers. This winter he put in a lot of mileage on nordic skis. ("Same muscle groups, different activity. You're in that pool so much, you'll lose your mind, so you've got to do something different.") But swimming predominates: this winter Heynes swam 75 to 90 miles in the pool each month. In March, he swam 140 miles. Earlier that morning, I watch him swim laps in the fitness center's four-lane pool in a bright, high-ceilinged room with sun streaming through a bank of large-paneled windows overlooking the Saturday crawl of traffic on Peach Street. Heynes powers himself across the pool with long, deliberate strokes, a clear wave breasting over his head. He pulls up after several laps to extend a hand. It's a strong grip. He sports a beard, goggles, a Pitt swimming cap. "I've just swum six miles," he says by way of introduction, accompanied by a puckish grin. (That's 400 laps.) He points to a rope extended from each end of the pool, just under the water's surface. "Underwater rope training," he says. "Helps my lats." I miss how he uses the rope, because he and his swim partner, Frank Karle, unattach it and and attach plastic milk jugs filled with water to their shoulders by long black elastic. "Now we'll do jugs," Heynes says, again with the smile. And he and Karle set off for more laps, this time pulling the gallon containers behind them. (I looked it up: a gallon of water weighs about 8.35 pounds.) They both visibly labor, demonstrating that pulling eight and a half pounds in a hydrodynamically inefficient container back and forth across a pool is difficult. Again, it's good for the lats. When Heynes pulls himself out of the pool I see short legs, but a long and thick upper body that radiates strength. His face is pale, an imprint from his goggles on his temples. How do you stay sane doing 400 laps in a pool, I wonder? "My mind is an iTunes library," says Heynes. Later over the shake I ask, why all the work? Why swim the lake a second time? For starters, Heynes lost his record in 2009 to Michigan man and Edinboro graduate, Randy McElwain. "I just want to show him I can do it faster," says Heynes. "Plus I gave my word. I said if anybody breaks my record in five years, I'll do it again. So I've got to keep my promises." Heynes also wants to be the only person to have made the swim twice. There's more. There's the Kanzius Cancer Research Foundation, which Heynes is supporting through his swim, encouraging people to donate through the website, "swim4acure.com". (There's also a Facebook page.) "We believe in the Kanzius Cancer Research Foundation," says Heynes, "and what good it can do for Erie and the world." Heynes has family, friends, and training partners who have had cancer themselves, or have seen loved ones struggle with it. "I want to help get them funded so they can get on with human trials and take care of this nonsense, and help people not to have to deal with it." Heynes likes the idea of being able to hand the Foundation a check when he finishes his swim: "That's more success for me, more even than the time." This kind of training is a way of life for Heynes. "I'm always training for something," he says. "We're always doing something, whether it's Iron Man triathlons, time trials, swim races, ski races. We're always training for something. We're training for life." The swim across Lake Erie is just another event in a series of events designed to list the limits of physicality, albeit an extreme one. And then there's the team. Involved are the psychological clinicians, for the visualization and other mental techniques to help deal with the mental aspect of the swim; the various sponsors who provide equipment, training advice, nutrition and other services; LECOM, which provides a place to train; and the donors, both to fund the attempt and the cancer foundation. But the team's core is a group of friends and training partners, like Karle, who'll swim paddle, run, bike, and train with Heynes over the ensuing months, and who'll man the 40-foot boots and kayaks that'll accompany him on the swim itself, when they'll feed, encourage, and guide him across the lake. And at the center of this group is Heynes' wife, Jamie, who's organizing it all. From maintaining the website and Facebook page to communicating with sponsors, from soliciting donations to organizing the logistics of the swim itself, Jamie is running the show, providing not only administrative talent, but a talent for understanding and support for a husband and father of a 3-year-old son who'll spend far, far too much time in a pool this summer. "She's getting through it," admits Heynes, "it's frustrating. She has to organize everything, and then she's on the water with me, kayaking, making sure the team's together and everything's going well. But she comes from a swimming background, so she's the perfect person to do that. She knows what needs to be done to be successful." And it's this team led by Jamie that seems to make it all worthwhile for Heynes. Karle and Heynes, for example, are not just training partners, they were friends in grade school and as life guards on Presque Isle – where, not coincidentally, Bob North, who set his own record in 1989 for crossing the lake, supervised. It's not just a team. It's a close-knit group of lifelong friends who toil alongside each other year round to achieve crazy schemes like this one: swimming across a Great Lake in record-setting time. If Heynes breaks the record, it's obvious it will in no small part belong to his team, too. "We assembled the best of the best of everything," said Heynes, "whether they're athletes, doctors, chiropractors, everything. It's top of the line. No one's going to beat this team." Heynes is planning to swim from Long Point, Ontario, to Freeport Beach in North East sometime after the Fourth of July weekend.